We develop Ektachrome (Process E-6) slide film in our St. Cloud lab, with one-hour and four-hour service times. 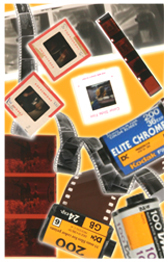 Kodachrome K-14 slide film processing is available through our out-lab service. One hour Ektachrome E-6 slide developing is available for a low additional cost. Normal service time for Ektachrome E-6 is about four hours. We produce beautiful 3½x5” to 44x96” color prints from slides and transparencies. The more prints you order, the lower the per-print cost. Slides can be created from color or black and white photographs, negatives, digital images, books, magazines, and art work. Price is dependent on the quantity of slides ordered and the size and type of your original images submitted. When we develop your slide film, we can scan your entire roll onto a CD. We also scan individual 35mm and 126-size slides onto a CD. The price per scan decreases as the quantity of scans increases. Choose “Reprint Quality Scans” (1500 x 1000 pixels) or “Enlargement Quality Scans” (3000 x 2000 pixels). Reprint Quality Scans will produce sharp prints up to 4x6 size. Enlargement Quality Scans will produce sharp prints up to 11x14 size. With a CD you can easily order prints using our in-store kiosks. Or you can order photos from your home computer using our Online Photo Lab. We produce 35mm duplicate slides (dupes) from any original slide or transparency from 35mm to 4x5 sheet film size. Quantity discounts are available.